A jigsaw may not be your first power tool purchase, but beginning woodworkers find it a valuable addition to their workshop. The challenge is finding the best electric jigsaw that includes the features you need without blowing your budget. With prices ranging from under $50.00 to well over $300.00, it’s confusing to know which model will suit your needs. Let’s decide which features are most important and narrow down the choices for you. Before making your purchase, you need to decide what you’ll be cutting. This power tool can cut many materials; from plywood, soft wood and PVC piping to tile, hardwood and steel. You’ll want to choose a machine that has the power and features for the type of work you’ll be doing. The most powerful motor can produce speeds of up to 3000 SPM (strokes per minute). A more expensive model generally has a more powerful motor, allowing you to cut harder, denser materials more quickly with the higher SPM. Additional features make your saw more useful and user-friendly. Features vary between models and price points. Built in lights, a laser cutting guide, an anti-vibration feature, and a dust collection system are all bonus features that you’ll find on the best models. These additional features transform a good quality saw into a superior quality saw and make your woodworking projects more enjoyable. You can use a jigsaw almost anywhere. It can make both curved and straight cuts through many different materials. Things like variable speed, orbital action settings, and a 360-degree orbital blade allow you to make cuts you can’t do with other saws. 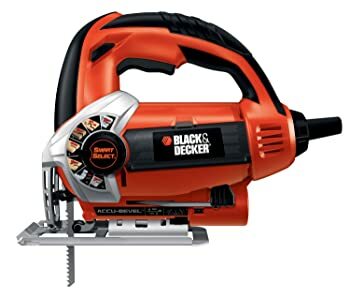 Slow, precise cutting, fast ripping of wood, cutting complex shapes and the ability to cut in tight spaces are easy when you use the best electric jigsaw. You can buy a saw for under $50.00, or you can buy the most expensive model for over $300.00. Investing in a quality tool doesn’t mean spending the most money. The quality of the tool’s construction and the included features are things to consider when choosing the best jigsaw. Weighing in at over 10 Lb, the Bosch JS470E is outfitted with a 7.0 AMP motor and can run up to 3,100 SPM. To regulate this powerful saw, there is a dial for setting the maximum speed and a trigger accelerator to control the operating speed. It also has an ambidextrous lock-on knob. The die-cast metal foot with steel insert is quite large, with a stable clamping system and an on-board bevel wrench. The footplate arm can hold up to 546 pounds of force. Four orbital-action settings offer a variety of blade strokes for cuts both smooth and aggressive. The low vibration design adds to your accuracy in cutting. The blade discharge lever prevents touching a hot blade, and the unit has a quick, tool-less blade changing system. The Makita 4329K jigsaw has a 3.9 Amp motor that’s powerful enough for everyday use. It’s also compact and lightweight, weighing in at just over 4 Lbs. The light weight and the ergonomically designed grip ensures you’ll be able to use this saw comfortably and without fatigue for even the most time-consuming projects. With three orbital settings as well as straight cutting and variable speed control from 500 to 3100 SPM, this jigsaw can cut many different materials and thicknesses accurately and easily. The die-cast aluminum base is adjustable both left and right to 45 degrees and the unit has a counterweight balancing system that keeps vibration to a minimum. The Makita 4329K sports an oversized trigger switch for effortless operation, and for extended use, there is a lock-on button. Cleanup is simple with this Makita jigsaw. It’s designed with a through-the-body dust port for great dust management when used with the clear dust cover and a vacuum. The self-storing hex wrench is always available for changing Tang shank style blades and making bevel adjustments. 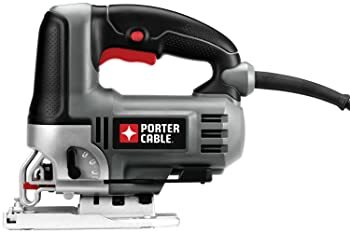 Weighing in at a sturdy seven pounds, the Porter-Cable PC600JS is powered by a 6 Amp motor and has variable speeds from 0 to 3200 SPM. It also boasts a four-position orbital lever to maximize your cutting performance on a variety of materials. The bevel can be adjusted to 0, 15, 30 and 45 degrees without the use of any tools for quick-change versatility. This saw is compatible with both Universal and Tang shaft blades, so you have a wide availability of blade types. The blades are easily replaced using a keyless changing system. For prolonged use, there is a lock-on button for consistent speed without tiring your hand and the saw features a LED light to maximize visibility. The Black & Decker Smart Select 5.0A features a dial with seven presets for optimum cutting on any material. The 5 Amp motor varies from 800 to 3000 SPM and provides a 3/4-inch stroke. The stable cutting platform has an adjustable shoe and features a channel for site lines. The dust blower keeps the cutting area clear, and you can attach a vacuum cleaner to the housing by using a hose adapter for clean, dust-free cutting. Bevel adjustments are simple with the Accu-Bevel that utilizes a fast-action lever and indicator window. It makes left and right angles of up to 45 degrees, with presets at 10, 15, 30 and 45 degrees. On-board blade storage and tool-free blade replacement make it easy to change and keep track of your blades. The versatile saw uses either Universal or Tang shank blades. The saw has a quick-action lever with viewing window to adjust the bevel up to 45 degrees. 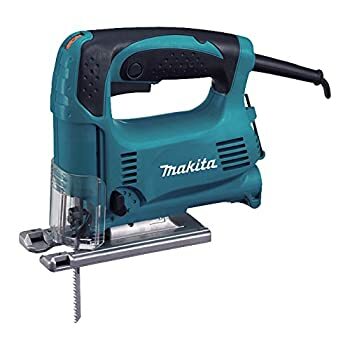 The Makita 4350FCT weighs 5.7 Lbs and has a 6.3 Amp motor, so it has plenty of heft and power to cut through a wide variety of materials. It has three orbital settings, along with a straight cut function. This saw also has a variable speed control knob that ranges from 800 to 2800 SPM, and it has a soft start feature for even starting. It also has an electronic speed control to ensure constant SPM when under load. The ergonomically designed handle is rubberized for comfort, there is 40 percent less vibration, and the saw has the lowest noise level for its rank to make this a comfortable saw you can use for hours without fatigue. The Tang shank blades are changed with a tool-less system, and the bevel is easily adjusted with a self-storing hex wrench. The built-in LED and dust blower are two features that provide clearer vision and increase your accuracy. With left and right adjustment up to 45 degrees, the die-cast aluminum base has a positive stop at 90 degrees for genuine cutting performance. The soft start causes a significant lag between the time the trigger is squeezed and the cutting action reaches operational speed. A jigsaw is an easy and safe tool for even a beginner. However, its utility is often overlooked, and the saw is relegated to the back of a shelf for the occasional curved cut. 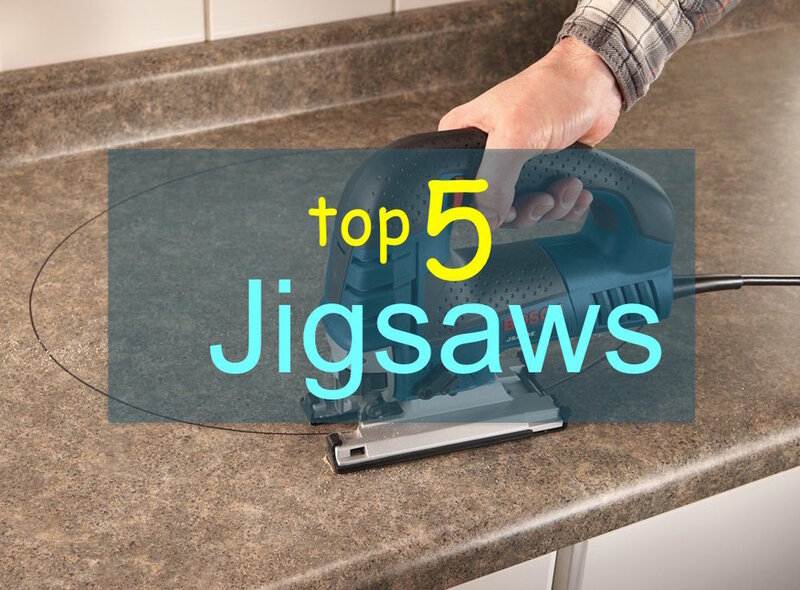 By choosing the right blades and the proper accessories, your jigsaw can be one of the most often used power cutting tools on your workbench. Jigsaw blades come in lots of lengths, widths and tooth configurations, so it’s important to choose the proper blade for your project. Narrow blades are generally good for cutting curves, and wide blades are suited for long, straight cuts. Blades with larger and fewer teeth cut rough, but very quickly. Blades with many small teeth cut a smoother surface but are slow. Even with a pencil guideline, your saw will want to wander off course. Use a clamped-down straight edge to keep your line true. Use a circular jig to create perfect circles and arches. A cordless jigsaw is very flexible; it can be used anywhere. However, a corded saw has more power for heavy, dense cuts and you never need to worry about draining your battery. The Bosch JS470E is the clear winner as the best electric jigsaw. Although it’s more expensive and heavier than other saws, it’s more versatile and powerful. Yes, it’s an investment, but you’ll use for years. At 7 Amps, it delivers powerful strokes at up to 3100 SPM with a variable speed dial. With a tool-less blade changing lever and easily set speed controls and blade strokes, this is an easy-to-use saw for all your projects. 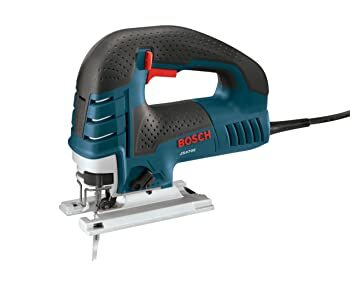 Although the Bosch JS470E is the clear winner, some folks can’t justify the cost. Other woodworkers may find the Bosch too heavy and cumbersome. If you fall into that category, you may find this runner-up a good alternate. 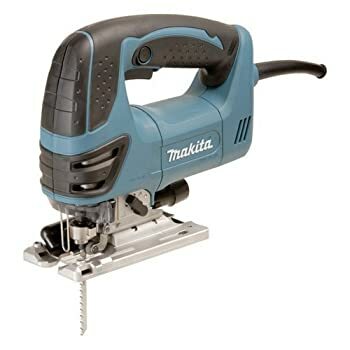 If you’re looking for good quality at a low price, the Makita 4329K is a decent little jigsaw. It’s very lightweight, so it’s appropriate for woodworkers who can’t handle the heftier models. Control and precision are, in part, due to the user’s ability to manage the saw. Its basic functions are suitable for the bulk of cutting you do in your workshop.